Not to be confused with Republic (Armenia). The Republican Party of Armenia (RPA, Armenian: Հայաստանի Հանրապետական Կուսակցություն, ՀՀԿ; Hayastani Hanrapetakan Kusaktsutyun, HHK) is a national conservative political party in Armenia. It was the first political party in independent Armenia to be founded (April 2, 1990) and registered (May 14, 1991). It is the largest party of the right wing in Armenia, and claims to have 140,000 members. The party controls most government bodies in Armenia. The Economist magazine has described the RPA as a "typical post-Soviet 'party of power' mainly comprising senior government officials, civil servants, and wealthy business people dependent on government connections." It has been described by political commentators as essentially lacking political ideology. The Republican Party's national conservative ideology is based on tseghakron, an early 20th-century Armenian nationalist ideology (roughly translated as "nation-religion"). It was formulated by Garegin Nzhdeh and holds that the Armenian national identity and state should carry religious significance for all ethnic Armenians. Former Prime Minister Andranik Margaryan classified this ideology as "Armenian racism". The Republican Party of Armenia was established in 1990 by Ashot Navasardyan. The birth of the RPA is also organically linked to the 1988 National Awakening, fight for independence and Artsakh national liberation struggle. The military-political unit Army of Independence, formed at the outset of the struggle, became the organizational basis of the RPA establishment. On April 2, 1990 the founding council composed of the detachment commanders of the Army of Independence proclaimed the establishment of the Republican Party of Armenia in Yerevan and became the first officially registered socio-political organization in the Republic of Armenia (registered on May 14, 1991). During the war first the Army of Independence, later the detachments composed of RPA members had an active participation in the struggle for the defense of the borders of Armenia and liberation of Artsakh. On May 27, 1990 these detachments were among the first to resist the Soviet troops in Nubarashen. They were also actively involved in the nationalization of the Soviet army weaponry and its transfer to the bordering areas of Armenia. The RPA was among the founders of the first Armenian military cemetery – Yerablur pantheon. Since its foundation and up to November 1997 the late Ashot Navasardyan had been the chairman of RPA. After his death and until March 2007 late Andranik Margaryan headed the party. The party has had a crucial contribution to the work of the coordinating council of voluntary armed detachments, thus promoting the establishment of law and order in the country. Following the formation of the Armenian regular army it issued a statement on its demilitarization. The RPA has convened nine (9) ordinary (in 1992, 1995, 1997, 1999, 2001, 2003, 2005, 2007, 2009) and three (3) extraordinary congresses (in 1996, 2002, and 2006). In 1999 the office of the party chairperson was abolished, and restored later in 2005. The RPA has constantly focused on inter-party ties and has been actively involved in setting up different political alliances. The party was among the founders of the National Alliance formed in 1992 after the deterioration of the situation in Artsakh. The RPA had an active participation in the work of the Civil Accord constitutional council shaped in 1993. In 1995 with the active involvement of the RPA the Republic pre-election association was set up. However, due to the disagreements on the regulation of the Artsakh problem, the RPA left the association in February 1998. In July 1998 the RPA, the Yerkrapah Volunteers' Union and the parliamentary Yerkrapah deputy group issued a joint statement, which commenced the political consolidation process within the RPA. Given the common ideology and political positions the Yerkrapah Volunteers’ Union sector engaged in politics was included in the RPA. Vazgen Sargsyan became the party leader. In 1999 together with the People’s Party of Armenia the Republican Party set up the Unity pre-election alliance. Following the parliamentary elections in 1999 the role of the RPA in the Armenian political life increased greatly. 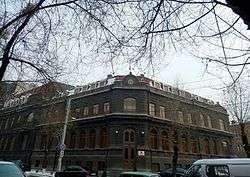 If in the 1990 Supreme Council (parliament) the RPA was represented by one member—Ashot Navasardyan and in the 1995 National Assembly of the first convocation—by five MPs, in the National Assembly of the second convocation elected in 1999 the RPA was the party with the biggest number of MPs (30). Functioning within the parliamentary majority Unity faction, in 1999, for the first time, the RPA was enabled to participate in forming the Government. Vazgen Sargsyan was appointed Prime Minister, with several RPA member ministers in his Cabinet. Following the tragic events of October 27, 1999, RPA representative Aram Sargsyan was appointed Prime Minister. Later, in May 2000 political rearrangements resulted in appointing Andranik Margaryan, chairman of the RPA council and the leader of the Unity faction, in capacity of Prime Minister. During his years in the Prime Minister’s office significant positive moves took place in the country’s economic and governing systems, and a tangible activity was carried out towards increasing the weight of national ideology in the social, political and public life. Being an ideological structure, the RPA has always focused on disseminating and enrooting its ideology and approach in the society. «The Republican» party's official newspaper, the «The Nationalist» book series, Tseghakron and Taronakan teachings, many analytical booklets highlighting Garegin Nzhdeh’s life and work, various commemorations and celebrations, pilgrimages, etc. served this target. In 2001, on the initiative of Prime Minister Andranik Margaryan, Garegin Nzhdeh’s 115th anniversary was celebrated at the state level. A number of educational and scientific institutions were involved in the celebrations, Nzhdeh’s works were published in two volumes, newly discovered works written by the great Armenian were brought to our country from Bulgaria. The parliamentary elections of May 24, 2003 resulted in increasing the number of the Republican Party’s seats in the Parliament, compared to 1999 elections. Thus, in the Parliament of 3rd convocation the Republican Party had the biggest faction with 40 MPs. In 2003, as a result of negotiations, the three political forces supporting RA President Robert Kocharyan—the Republican Party of Armenia, the Armenian Revolutionary Federation and the Rule of Law Party (Orinats Yerkir)—formed a parliamentary coalition and confirmed it with a Memorandum signed by the leaders of the three parties. Andranik Margaryan continued to head the Armenian Government, where seven ministers nominated by the RPA were in the office. The Parliament Deputy Speaker and three out of the six chairpersons of parliamentary standing committees were also elected from the Republican Party. In May 2006 the Rule of Law Party left the parliamentary majority, and the National Assembly was subject to rearrangements of political forces, which resulted in RPA Chairman Tigran Torosyan becoming the Speaker of the Parliament. The RPA 10th extraordinary congress of July 2006 proclaimed the Republican Party of Armenia a national conservative party. The congress decided to restore the office of the party council chairperson, which had been abolished in 2005. Serzh Sargsyan was elected a chairperson of RPA Council. On March 25, 2007 the RPA chairman Andranik Margaryan died, and the council chairman Serzh Sargsyan assumed the duties of the RPA chairman. On April 4 Serzh Sargsyan was appointed Prime Minister. At the parliamentary elections of 12 May 2007, 33.9% of voters supported the Republican Party of Armenia. RPA faction was formed with 64 MPs. RPA Vice Chairman Tigran Torosyan was elected Speaker of the Parliament. The Republican Party signed a coalition memorandum with the Prosperous Armenia Party, and a memorandum of cooperation with the Armenian Revolutionary Federation. Government led by Serzh Sargsyan was formed based on the results of parliamentary elections. On 10 November 2007 the 11th ordinary congress of the RPA was held, and some amendments to the Charter were made. The office of the party council chairperson was abolished, and the RPA Executive body was elected as the permanently functioning governing body, while the RPA Council was elected as the party's representative body. Serzh Sargsyan was elected RPA chairman. At the presidential elections of February 2008 Serzh Sargsyan was elected President of the Republic of Armenia. The Republican Party of Armenia, the Prosperous Armenia Party, the Armenian Revolutionary Federation and the Rule of Law Party signed a coalition agreement, and based thereon was formed the Government led by Tigran Sargsyan. Following Tigran Torosyan’s resignation in September 2008 Hovik Abrahamyan, member of the RPA executive body, was elected Speaker of the National Assembly. At the 12th congress of the RPA held in November 2009 RA President Serzh Sargsyan was re-elected as party chairman. The elections to the Yerevan City Council of Elders were held in May 2009, where the RPA gained the overwhelming majority of mandates and formed the largest faction in the Council of Elders. Immediately after, RPA nominated candidates for the Mayor and First Deputy Mayor positions. In 2009, following the Council of Elders resolution, Mr. Gagik Beglaryan, member of RPA Executive body, was elected Mayor. In 2010 a member of RPA faction in the Council of Elders Mr. Karen Karapetyan became elected as Mayor. Deputy Mayor and member of RPA Council Mr. Taron Margaryan was elected Mayor in 2011. In November 2011 after the resignation of the NA President Mr. Hovik Abrahamyan, Mr. Samvel Nikoyan, member of RPA Council, was elected NA President. Most of Armenia's so-called "oligarchs" (government-connected entrepreneurs who enjoy de facto monopoly on lucrative forms of economic activity) are affiliated with the RPA. In an RPA congress held in Yerevan in November 2007, then Prime Minister and presidential candidate Serge Sargsyan acknowledged that bribery, nepotism, and other corrupt practices are widespread in Armenia. "Tax evasion and corruption must be regarded as a disgraceful and condemnable phenomenon," said Sarkisian. "We must not take into account family ties and friendship and must not regard as friends and supporters those people who will avoid paying taxes and tolerate this vicious phenomenon." However, his opponents have long accused him of sponsoring the oligarchs enjoying the economic kickbacks. Samvel Aleksanyan (Lfik Samo), a parliament deputy with close ties to former President Robert Kocharian and current President Serzh Sarkisian, whose Salex Group has a monopoly on imports of sugar, flour, cooking oil, butter and other basic foodstuffs. Aleksanyan has been accused of hiding his true income, declaring his income for 2015 was 10 million AMD in addition to his 6.2 million AMD salary as a MP. His wife Shogherina Mkrtchyan declared her cash assets for 2016 as 3.7 billion AMD and 8.8 million US dollars, and had purchased property at over 4 million US dollars. The Aleksanyan family also owns the Yerevan City supermarket chain. Aleksandr Sargsyan (Sashik), brother of President Serge Sargsyan and parliament deputy who has a fifty percent stake in Multi Lion, Armenia's leading supplier of liquefied gas to households, cars and buses (the other fifty percent is owned by Gagik Tsarukian's Multi Group). Ruben Hayrapetyan (Nemets Rubo), is a former parliament member with close ties to former President Robert Kocharian and current President Serzh Sarkisian. Ruben Hayrapetyan resigned from parliament in June 2012 following the controversial death of an army doctor, (Vahe Avetyan) at a restaurant owned by him. Hayrapetyan is currently the President of the Football Federation of Armenia. Mher Sedrakyan (Tokhmakhi Mher), a member of the National Assembly. In September 2008, the Audit Chamber of Armenia accused Suren Khachatryan, governor of the southeastern Syunik Province, and government officials subordinated to him of embezzling 575 million drams (US$1.9 million) worth of public funds and property. Surik Khachatrian claims he is innocent. As part of Republican bloc. 1 2 Leader Admits Tensions In Ruling Party, Armenia Liberty (RFE/RL), October 28, 2008. 1 2 Provisions of RPA Program, Republican Party of Armenia, 2008. 1 2 3 Iskandaryan, Alexander (23 May 2012). "Armenian Elections: Technology vs. Ideology" (PDF). Caucasus Analytical Digest. ETH Zurich: 3. Both major parites in the Armenian parliament [Republican Party and Prosperous Armenia] represent elite groups. With almost no ideology to speak of, they are catch-all parties, a phenomenon becoming typical in the modern world. 1 2 3 Sarkisian Blasts Ter-Petrosian As Election Showdown Looms, Armenia Liberty (RFE/RL), November 12, 2007. ↑ Armenia's dreadful politics, The Economist, April 11, 2007. ↑ Armenia Hit By Sugar Shortage, Armenia Liberty (RFE/RL), October 23, 2007. ↑ Sarkisian’s Brother Admits Business Interests Abroad, Armenia Liberty, October 3, 2005. ↑ Regional Governor Accused Of Corruption, Armenia Liberty (RFE/RL), September 24, 2008.